The classy Maine Surf White 3 Door Combination Wardrobe consists of three doors and two drawers providing clever and convenient storage for your clothing and accessories. A delicate and timeless piece to add fashionable style to any bedroom. Made from solid pine and finished with durable white lacquer paint, the Maine Surf White Three Door Combination Wardrobe is built for permanence. Delicate features such as pewter handles and panel detailing adds an elegant touch to this strong piece. With two drawers, chamfered cabinetry and three doors this Maine Surf White Two Door Combination Wardrobe is perfect for anyone with a need for discrete storage and a desire for style. 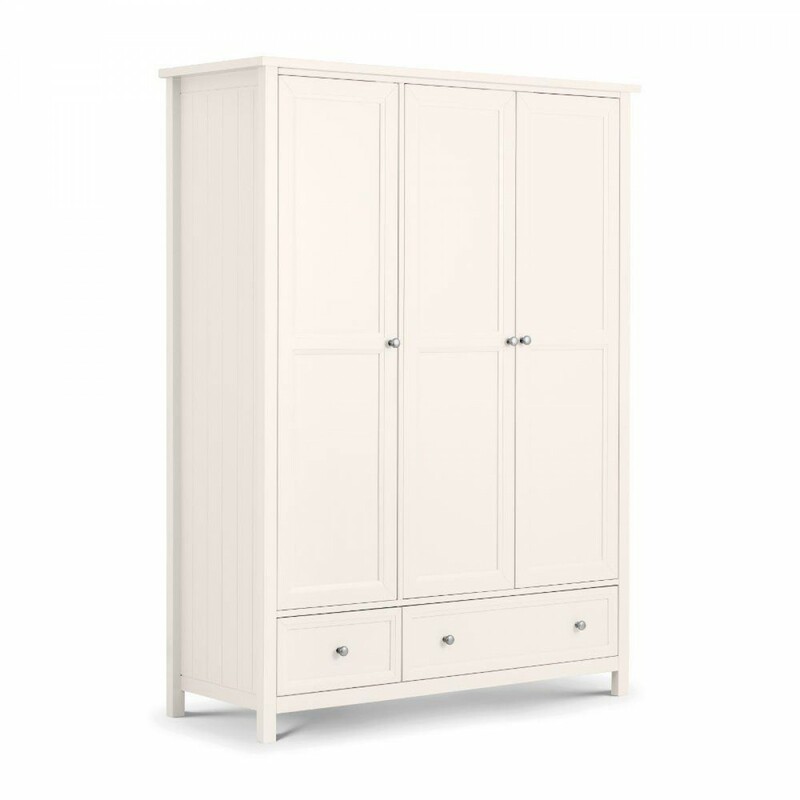 This Maine Surf White Three Door Combination Wardrobe is built for endurance from a solid pine material with MDF and finished with a surf white durable lacquer. A neutral white finish complimented by pewter handles creates a New England style class to any bedroom. The three doors ensures ease of access and reveals plenty of storage space cleverly hidden away inside, featuring two internal drawers and cabinetry. Detailed side panelling adds character and individuality to the piece whilst providing a delicate touch. The neutral colour scheme of this collection makes this Maine Surf White Three Door Combination Wardrobe suitable for any bedroom and colour scheme whilst adding a classy touch. Behind the three doors, there are two internal drawers to perfectly fit your storage needs: a large drawer (76.5cm x 43.8cm x 19cm) and a small drawer (37.3cm x 43.8cm x 19cm) perfect for clothing and accessory storage. There is also chamfered cabinetry for convenient storage of any accessories or shoes, plenty of storage features to keep the interior of your bedroom free of clutter! Finishing touches such as side panelling and pewter handles leaves a beautiful external finish of the Maine Surf White Three Door Combination Wardrobe, making it a timelessly stylish addition to any bedroom. The solid pine material with MDF provides a high quality construction of the piece, giving you confidence that it will last. A good size for storage: 190cm x 141cm x 55cm. The Maine Surf White Three Door Combination Wardrobe is easily self-assembled and accompanied with full instruction manual to ensure easy construction.